Warehouse Circus Inc. are bringing their high flying cast of young artists to shatter your idea of extraordinary with their new show Refract. An ignorant sailor attracts the attention of a cheeky siren who is determined to rock the boat. Travel with the pair down the river and see what lies just beyond each bend. Refract asks audiences to explore the world in a brand new light and come away with a newfound appreciation for life’s simple but perfect patterns and simplicities. Join the cast of Refract as they tumble, flip, fly, throw, catch and sail their way through the world that is and the world that could be. Demonstrating an impressive array of skills from Acrobatics to Club Juggling, Trapeze to Toss the Girl, these 17 young performers aged 12 – 20 will keep you on the very edge of your seat. “It’s an honour to work with these young artists” Says Director Nathan Anderson, “We’re telling a story with complex ideas, devised in collaboration with 17 talented performers. We have nailed more difficult skills than ever before. 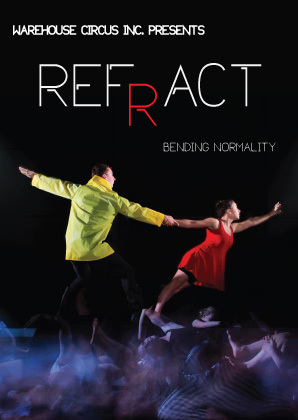 Audiences are going to love Refract”. Visit warehousecircus.org.au for further information. Warehouse Circus Inc. is Canberra’s premier youth circus organisation. They are nationally recognised for their contribution to the Australian Youth Circus Sector and for graduates undertaking tertiary studies at the National Institute of Circus Arts (NICA) and with touring companies such as Circus Oz and Circa. They are a hub for professional circus arts in Canberra, feeding the sector with emerging performers, directors, trainers and technicians, providing access to appropriate development and rehearsal space for local and touring artists and working to build audiences for Circus Arts in Canberra.